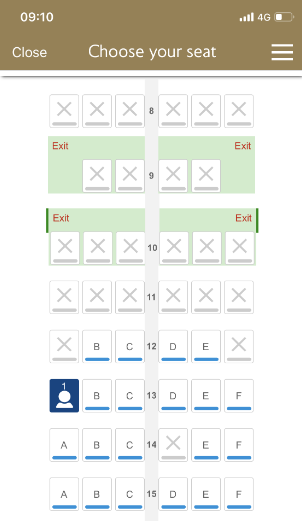 This thread examines BA's use of Amadeus' Theoretical Seating module. This kicks in at T-72 hours before departure, so this thread is primarily of interest to those travelling within the next few days. Do BA ever move passengers from seats next to elites in order to block them? I had an experience where the seat in CW next to me was occupied and then at T-72 it and a few other seats became blocked. (I am using EF to check the seat map). Do BA ever move passengers from seats next to elites in order to block them? Ahhh, I've had that happen before. Annoying! I have wondered whether I would have the courage, in that situation, to explain quietly and politely that the seat is unoccupied because it has been blocked owing to my status and then what reaction one would get from the crew member / other pax. worldtrav, BlueThroughCrimp, morges1 and 3 others like this. A fair comment However, more seriously, is it actually unreasonable, to ask for a benefit offered to GCH's to be honoured ? Would I qualify for the DYKWIA thread if I kicked up a strop at an outstation if the check in desk sent me off to the ET desk or I complained because I was denied entry to the lounge with an ET BP ? Is not the problem with theoretical seating that its existence is likely very little known outside FT circles ? I asked the question because I came very close to this on Friday when flying back on an E190, with myself in the exit row aisle and an empty window seat next to me. I could see someone in a non-exit seat across the aisle and in the row in front (therefore non-reclinable) hungrily eyeing up the empty seat, but I think my glacial stare, combined with the fact that he would have physically had to climb over me, must have put him off. I was musing to myself how I would have reacted if he had tried, and concluded that I would probably have stood my ground ! It isn’t actually a benefit, more of a consequence of TS. There is no mention of this ‘benefit’ or TS anywhere on BA.com, we wouldn’t even know TS existed if not for this topic. 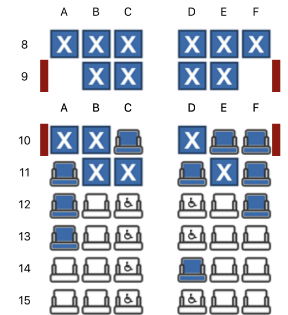 Some rows are blocked but have one or two seats occupied already (according to Expertflyer). On my MMB, I cannot select those however (BA Gold). See screenshots. Anyone with an idea of whats going on here? Is it worth to call up and ask for 10A, could the Gold Line help here? Also, I can’t remember when I’ve last seen an A321 on the DUS route. Sorry if this has been asked before, but if I am gold, and seated in eg ET 10A, and another gold is in 10C, does that mean that even to either of us, as golds, the B seat is blocked by TS? I'm stuck back in 67F, an aisle seat in the middle block of WT+ on the 269 LHR-LAX flight tomorrow, after losing my slightly better seat due a cancellation. Expert Flyer is showing 67E as an X at present, so if that is being blocked and things remain as they are, at least that's something. No, Golds can take over a TS block if the other passenger is Gold. One good reason to spread the news about TS is so that Golds are a bit more intelligent on their seat selection ideas - and not just try to get as near the front as possible. But if you were Silver in 10A then you probably won't get access to 10B. Plus, if every window/aisle seat is taken, someone putting in special pleading at the airport may well get 10B as a consolation seat (and they typically won't be a Size 9).